Taos weekend | ride. travel. live. 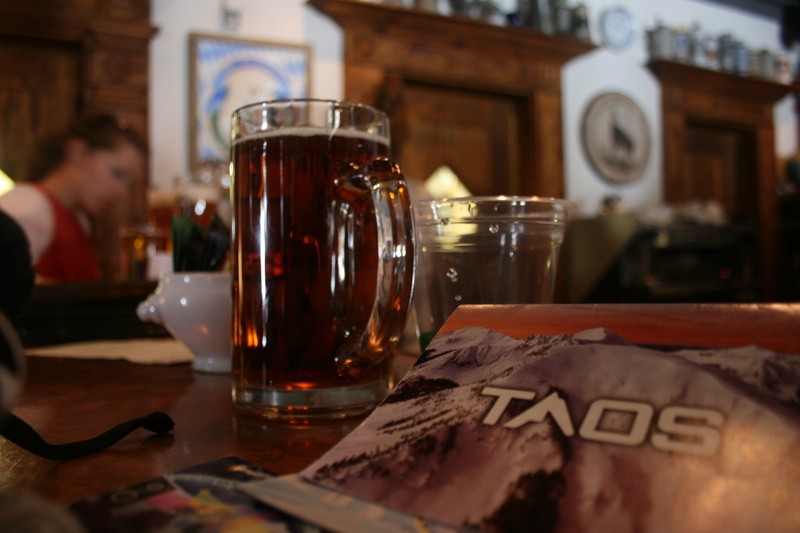 I finally got to Taos mid-season, where everything was open. I chose a fine day to experience it. Last time I was there, the ridges were mostly closed, and it was still early season. 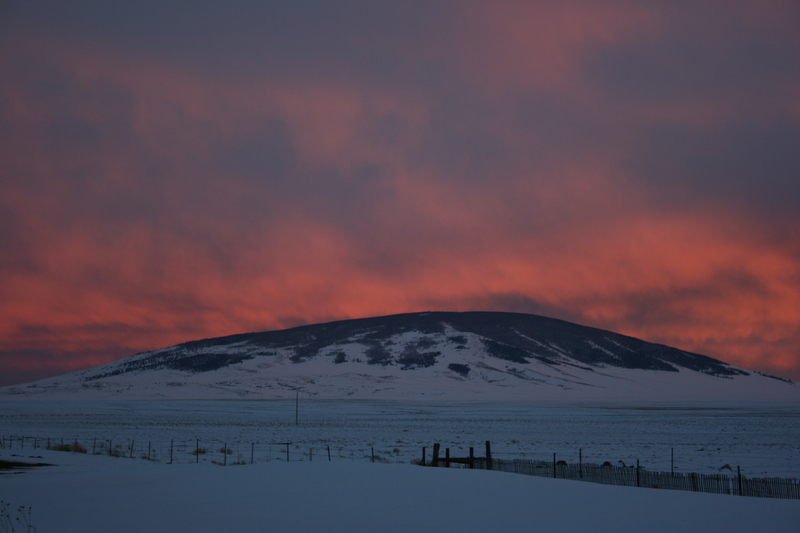 Since then, a lot has happened, which has curtailed my snowboarding days by a lot. At least on this day, it was sunny, the conditions were quite good, the snow was fine, and the winds relatively calm, so I spent most of the day hiking the ridges. The lifts take you to a top elevation of 11819 feet (3603 m), and to access the hard stuff, and a lot of the goods, you need to hike the ridges, accessed from the upper terminus of the top lift. 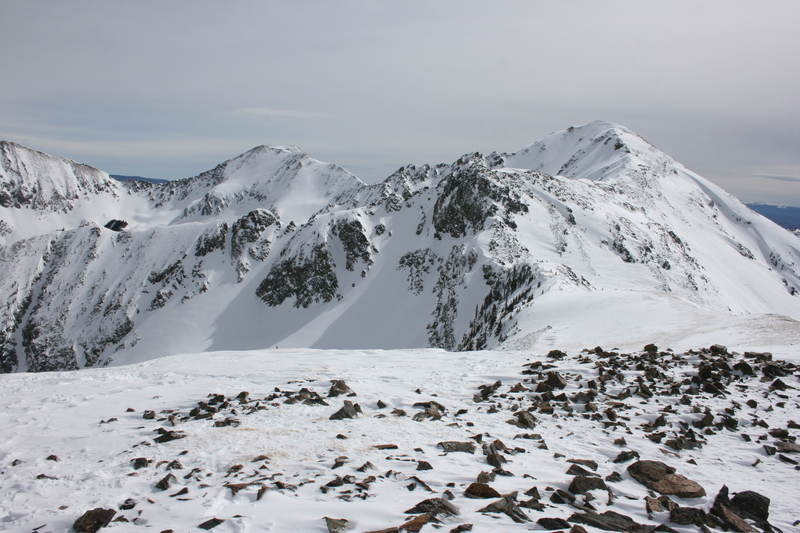 One extends to the right towards the ‘front side’, mostly shorter stuff that involves hiking up about 30-40 feet vertical and about 5-10 minutes, the other ridge goes left towards Kachina Peak, which is the top of the resort, at 12481 feet (3805 m). 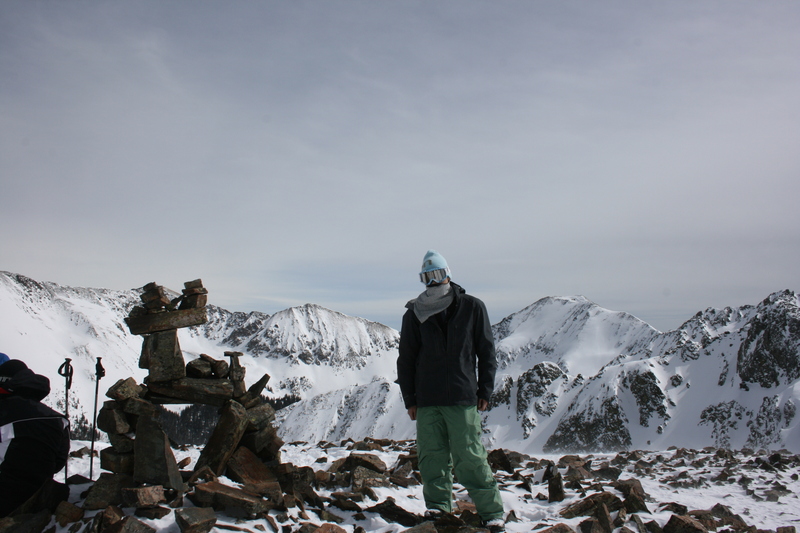 After doing a few runs on the front side stuff, I decided around 12:30 to hike to Kachina Peak. This hike is a good 45 minutes, and involves the 662 foot vertical difference, and a few ups and downs, so it’s more like 800+ feet up in the process, and more than a mile of hiking. At elevation. After plenty of huffing and puffing from this sea level dweller, passing a few people, and being passed by others, I made it to the top. I was tired and feeling like a swamp dweller by the time I got there. 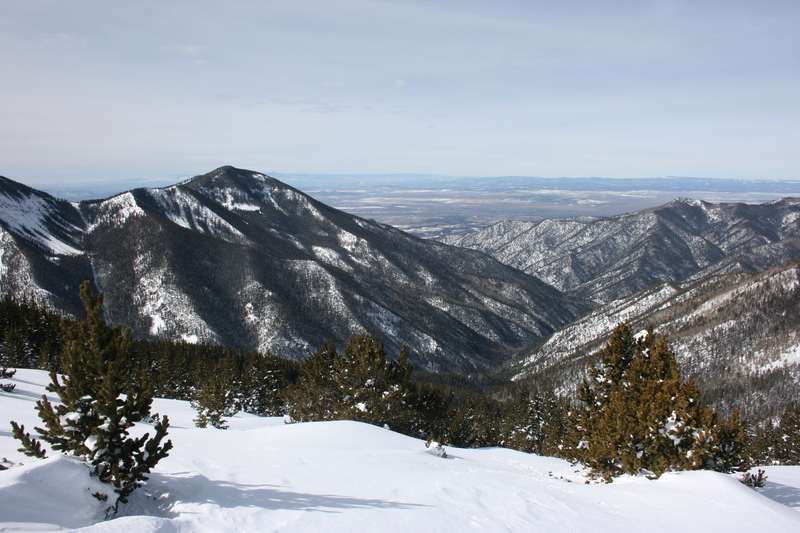 The views are magnificent, encompassing a wide swath of New Mexico and Colorado, from the Jemez Mountains to the San Juans and Sangre de Cristos. Yours truly at the peak. Luckily I was rewarded by a fantastic powder descent, and a well-deserved beer at the Bavarian at the bottom. Normally I don’t imbibe on the slopes, but I made an exception for this occasion. A nice 18 oz. Oktoberfest beer waiting for me. 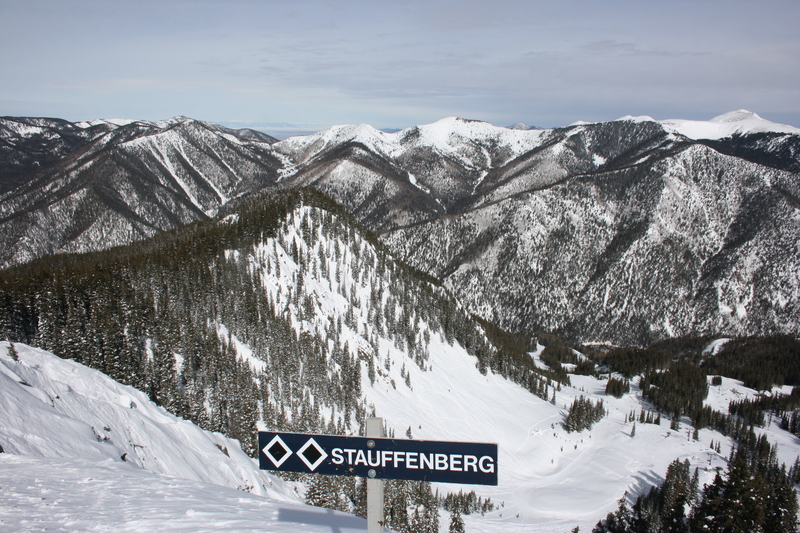 A note on the origins of the trail names at Taos Ski Valley: you’ll notice from the trail map a mix of German and Spanish names, reflecting the roots of the founder Ernie Blake, and the state of New Mexico. So a couple of the names stand out, Stauffenberg and Tresckow, who were among the people who died in the failed plot to assassinate Hitler in 1944. To cap it off, I witnessed a very nice sunset as I crossed into Colorado.